The first Google Image result for "beguiling charm." 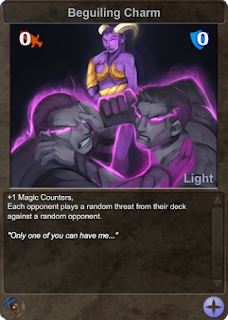 Incidentally, this card appears to use Radiant Orchid. Coincidence? Conspiracy? God? Prescience? Plagiarism? You guys! We're not even done with New Era Year 13 yet and Pantone is already announcing which color will be the color of the year next year. If you'll recall, this is the year of 17-5641 Emerald. Yeah, you know, the same color as that pillow you bought on a whim at the discount store--to add a splash of color (something different and bold)--to your otherwise beige life. Radiant Orchid blooms with confidence and magical warmth that intrigues the eye and sparks the imagination. It is an expressive, creative and embracing purple--one that draws you in with its beguiling charm. A captivating harmony of fuchsia, purple and pink undertones, Radiant Orchid emanates great joy, love and health. (Their words, not mine) All of those words mean things, but strung together as they are in that paragraph they aren't really cohesive. The marketing team picked feelings that they wanted the new color to evoke (or whatever), and then fiddled with sentence structure until the squiggly green lines went away. Also, they don't use an Oxford comma. It's punctuationally acceptable, but it pisses me off. I need that separation! If you want to read more of their nonsensical blabber, the full press release is here. Based on my knowledge of the fashion industry (all of which I learned from The Devil Wears Prada movie) it may take a while for this color to trickle down to us common folk. Or it's already been in high fashion and the good folks at Pantone are letting us plebeians know that it's en vogue. Either way, expect to see a lot of Grimaces in 2014. (Click the Grimace link before reading this:) beguiling charm. What has two thumbs on the space bar and is drawn in (to that)? T hi s gu y.